Give your friends and family a gift they’ll love! 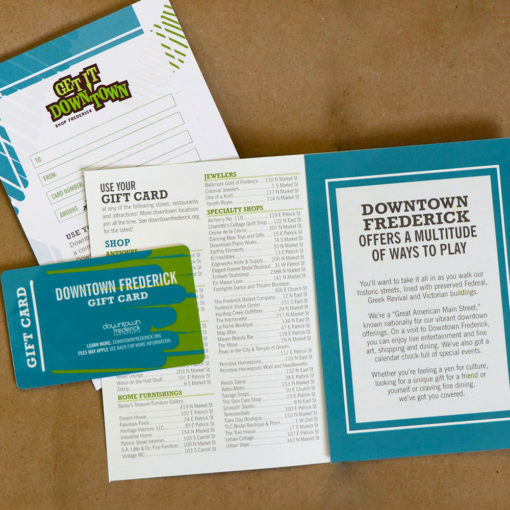 The Downtown Frederick Gift Card can be used at more than 170 downtown stores, restaurants, theaters, and galleries. We recently redesigned the card and packaging, giving it a more handmade feel to better reflect Frederick’s local artisans and crafters, and made it smaller so it’s easier to gift. Use your gift card to grab a bite to eat or #shopsmall each Saturday in December during Downtown Frederick Partnership‘s four Saturdays!